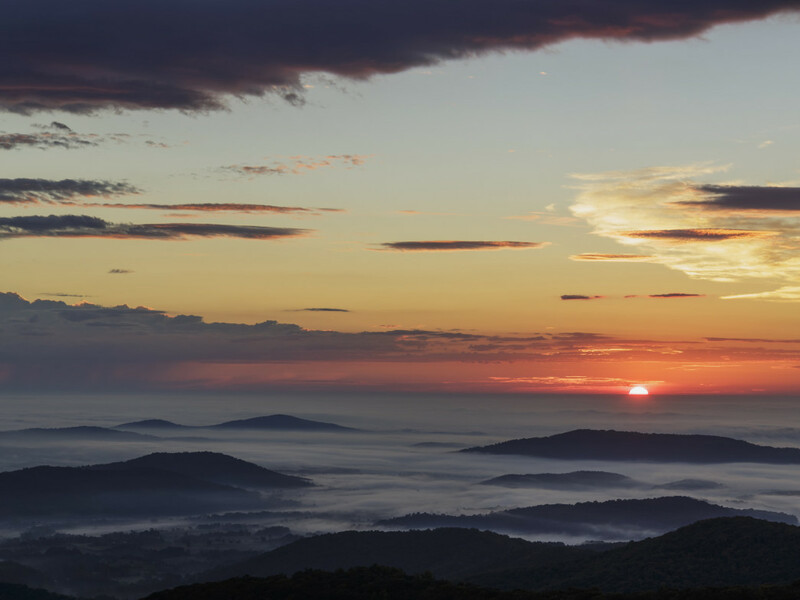 Known for its expansive views of misty mountains, winding rivers, and verdant valleys, Shenandoah National Park is a nature-lover's paradise. Less than two hours southwest of America's bustling capital, this 311-square-mile oasis of wilderness snakes along the ridgeline of the Blue Ridge Mountains, one of the oldest ranges on Earth. Craggy outcrops create plentiful cascading waterfalls, while the lush forest shelters abundant wildlife. Deer, fox, wild turkey, coyotes, and the densest population of black bears in the U.S. call Shenandoah home. Wild-flower lovers have an ever-changing palette of blooms from spring through fall, and birders seek out over 200 species, from harmonious song birds to large birds of prey. Shenandoah was authorized in 1926 and construction of Skyline Drive, the park's only public road, started in 1931 as a Works Progress Administration project during the Great Depression. The park was fully established in 1935 and Skyline Drive opened for traffic in 1939. All park maps reference mile markers (MM) running north-south starting at Front Royal (MM0.0), and continuing south to Rockfish Gap (MM105.4). Most people visit Shenandoah to tour the Skyline Drive, especially in October, when the fall foliage explodes into a kaleidoscope of color. 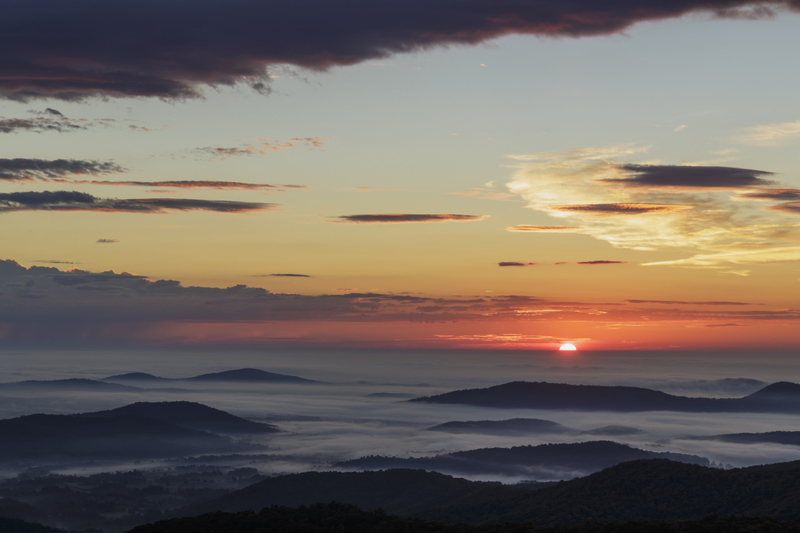 This National Scenic Byway meanders along the backbone of the Blue Ridge for 105 miles. The speed limit is strictly enforced at 35mph, so the entire drive takes about three hours one way. The low speed limit allows visitors to play their favorite driving music, roll the windows down, and enjoy a leisurely cruise. The strenuous, nine-mile hike to the 3,291-foot summit of Old Rag mountain is the most popular hike in the park, and perhaps in the mid-Atlantic region. What hikers miss out on solitude is made up with 2,300' of elevation gain, and a spectacular, exposed granite summit. The last mile tackles an exposed Class 3 rock scramble that can be tough for casual hikers. Going counter clockwise is arguably more enjoyable, as negotiating the scramble is a bit easier going uphill. Amateur geologists love going through the "cave" and the natural staircase of columnar basalt. One of the few hikes that is not accessed via Skyline Drive, the main parking lot is at the end of State Route 601 near Sperryville. It's imperative to arrive before 7 a.m. to get a spot, earlier if it's during the fall leaf-peeping season. Those looking for a less demanding, but equally stunning peak head to Hawksbill Trail (MM45.6), the park's high point. It's 2.9 miles round trip with 860' of elevation gain, and follows a short section of the Appalachian Trail. Near the top, a stone hut with a picnic table offers up a rest with a view. The rocky summit is spread out, so even when busy, there is still a good chance of solitary, 360-degree vistas. White Oak Canyon (MM 45.5), has lots of options for waterfall lovers. 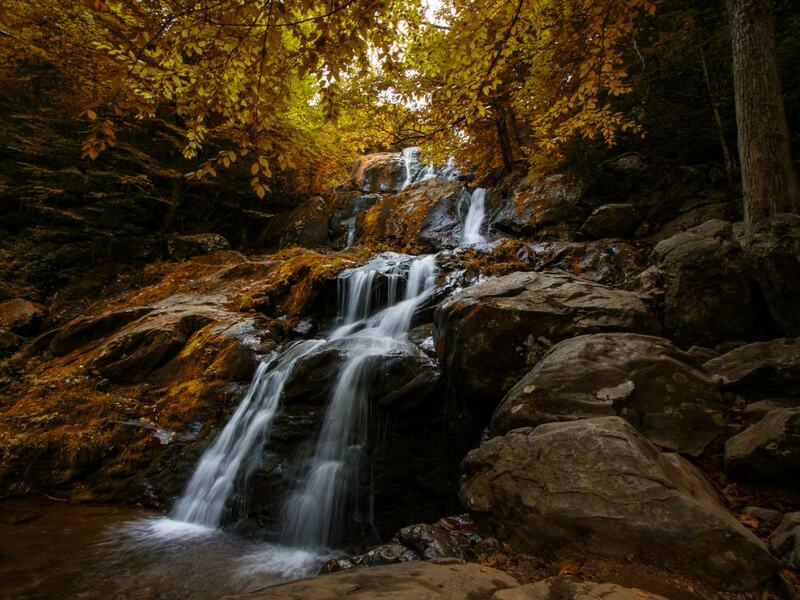 The standard loop is 9.1 miles with 2,560' of elevation and follows a beautiful, deep ravine and shady hemlock groves to eight waterfalls including a natural slide and the 86-foot-high White Oak Cascades. You can tailor the distance to just hit the upper falls at 4.6 miles, or do the 12-mile extended loop summiting HawksBill. For rock climbers, Old Rag mountain proudly features some of the best climbing in VA, with about 80 routes ranging from 5.4 to 5.13. The Yosemite-quality granite yields splitter cracks, perfect dihedrals, and crystal pinching on run-out slabs up to 100' tall. Little Stony Man Mountain (MM39) has about 20 high-quality routes, all below 5.10. In the southern end of the park, the North Fork Moorman's Area has many two- and three-star routes. Road cyclists have 105 literally breathtaking miles with 15,000' of climbing on the Skyline Drive. There is little shoulder and riders are required to ride single file and have front/rear lights on in times of fog and when riding through tunnels. There is no mountain biking allowed in the park. With more than 70 mountain streams and 38 species of fish, including large populations of rainbow, brook, and brown trout, the park is a hot spot for anglers. Trout pulled from the Rapidan river (MM 52.8) routinely average 6-12 inches long. Big Run (MM81), the largest stream in the park, is another local favorite. Its remoteness depends on how long one is willing to hike, it happens to have excellent camping as well. 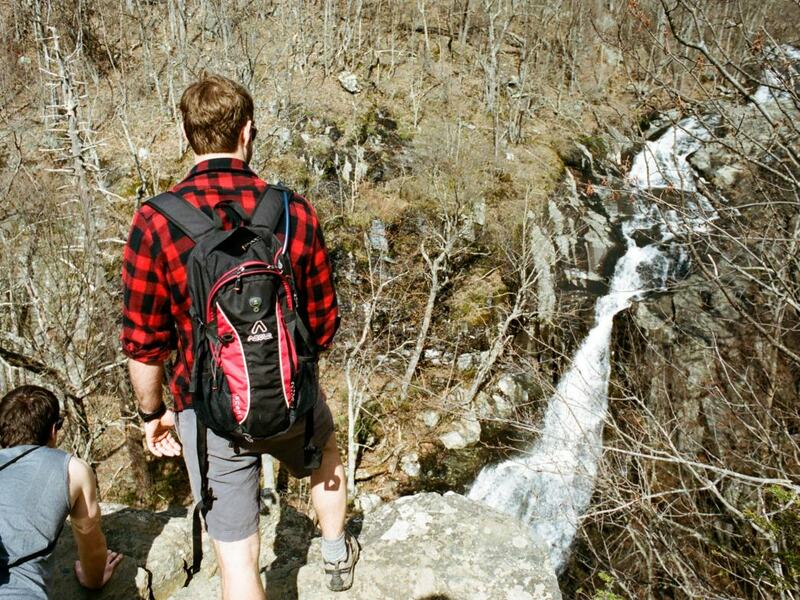 There are over 500 miles of hiking trails in Shenandoah, and 40% of the park is designated wilderness. 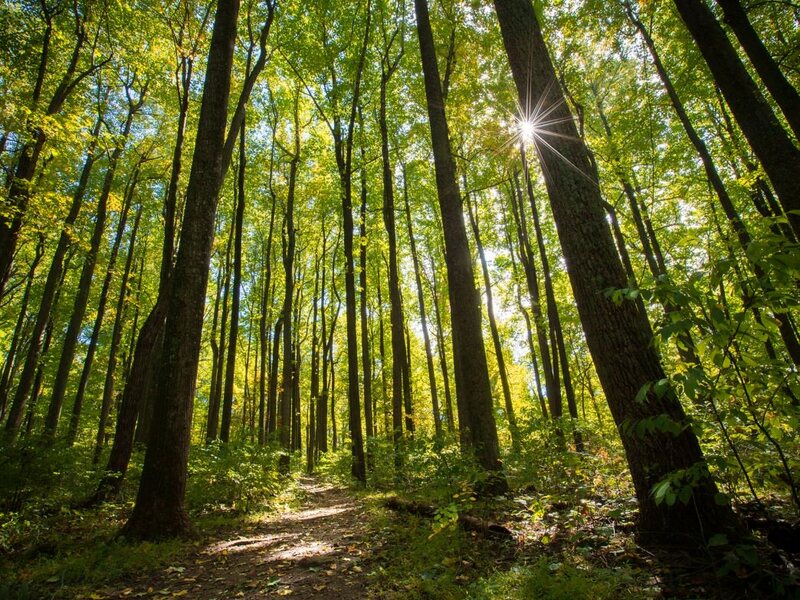 To grasp the true essence of the park however, try hiking the 101 miles of the famed Appalachian Trail. It's the longest section hike of the AT, though not particularly difficult, taking between five and 13 days, depending on speed. One important note: the trail does not cross any streams, so hikers have to carry their own water or add mileage to get to waterfalls. A free permit is required to camp. Avoid mid-May through mid-July, north-bound thru hikers arrive and hut space and camping spots disappear. For the best photo ops, schedule summit hikes on clear days for the best view. Also try to hit the top by late afternoon as opposed to mid day (assuming good weather), the light is more interesting. Conversely, plan waterfall hikes on cloudy days, waterfalls photograph better with less contrast. Food and supplies average every 25 miles, and range from small markets to seasonal fine dining restaurants with live entertainment. The largest is Big Meadows (MM 51.2), with dining and lodging options, a gas station, and a well-stocked store. The Pollock at Skyland (MM 41.7), features pan-seared trout pulled right from nearby Rapidan river. If visiting in September, stay for the Apple festival. See apple butter simmering in large copper kettles and sample exquisite apple recipes from local chefs. The kids get pony rides, the adults listen to live bands; everyone drinks warm cider, and no one leaves hungry. The aptly named Blue Ridge Mountains get their distinctive hue from Isoprene, a hydrocarbon released by trees (especially oak and poplar, of which the Shenandoah has a massive population) to protect themselves from heat and insects. Isoprene interacts with other molecules to form aerosols that scatter the shorter wavelengths on the blue end of the light spectrum. There are four campgrounds in Shenandoah, three of which offer potable water and dump stations for RVs (no hook ups). A free permit is required for backcountry camping. Park fees are $20 for passenger vehicles, $15 for motorcycles, and $10 for bicycles. Passes are good for seven consecutive days. Annual passes are $40.